Maggie Pina (left) and Notre Dame Academy teammate Mandy McGurk celebrate the milestone of each scoring 1,000 points in their basketball careers at the school in Villanova. Two Catholic school basketball players who have shared the court since kindergarten have just scored the 1,000th point of their respective careers. 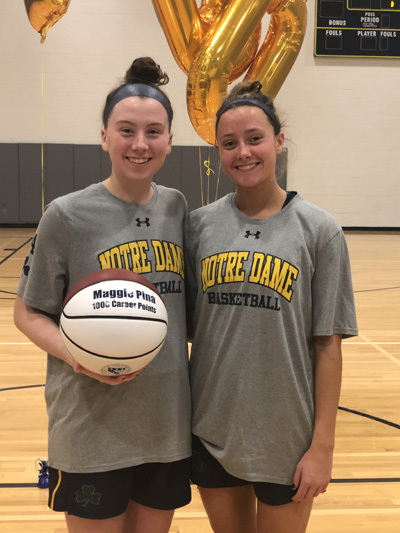 Between them, Academy of Notre Dame de Namur seniors Mandy McGurk and Maggie Pina have spent 20 years taking it to the rack. Despite their long experience, they were each surprised when they hit the four-digit milestone. McGurk, a senior point guard, never doubted Pina’s capabilities, although she herself wasn’t sure about hitting that mark. Despite her uncertainty, she scored her 1,000th point during a 54-31 win against the Baldwin School on Jan. 4, becoming the 11th player in the academy’s 162-year history to do so. Just a few weeks later, Pina joined the same ranks during a 73-43 rout of Springside Chestnut Hill Academy on Jan. 23. The academy will commemorate the achievement by adding the players’ names to a banner on the gymnasium wall, capping their years as friends and teammates. “It feels nice that Mandy and I leave our marks on Notre Dame basketball,” said Pina, adding that the recognition will help attract additional support for the athletics program. McGurk started out with CYO basketball at SS. Simon and Jude in West Chester, while Pina belonged to St. Patrick Parish in Malvern. The pair met through the Drexel Hill-based Comets Girls Basketball Club, and after a brief hiatus when Pina attended Archbishop Carroll during her freshmen and sophomore years, they reunited at Notre Dame. During their 2017-2018 junior season, both athletes were named as First Team All-Inter Academic and First Team All Main Line players. McGurk was also a member of First Team All Delco, while Pina made Second Team All-Delco. The two were also among 800 U.S. high school players who were nominated to play in the 2019 McDonald’s All American Games. Although they did not appear on the final 24-spot roster for the March competition, the duo are now focused on the Pennsylvania Independent Schools Athletic Association (PAISAA) tournament, which they will kick off on Feb. 15 with a home game against the George School in Newtown. After graduation, both players will continue their basketball careers at the Division I level. McGurk has committed to the University of Pennsylvania, while Pina will head north to Boston University. They rank as the fourth and fifth highest scorers respectively in Delaware County, with McGurk averaging 17.7 points per game and Pina averaging 15.1. “They’re having a good year so far,” said Notre Dame head coach Lauren Thomer.